If I had to choose only one way to prepare potatoes for the rest of my life, this would be it. And even if I weren’t forced to choose, this might still be it. I have been having a hard time getting this recipe posted because each time I begin, I am lured in by the memory of the rich, creamy texture and the luscious, hearty flavor, and I head downstairs to make more. So, before yesterday’s batch is gone, I resolve to stay focused and get this published. I found this recipe in a recent issue of Cook’s Illustrated magazine. I have subscribed to this magazine for years, and whenever it arrives, I usually read it cover to cover in one sitting (or, one lounging-on-the-couch, if we’re going to be totally honest). I try to hold off until after I have eaten dinner, as I have learned from experience that hunger pains and this magazine do not bode well together. More than once I have found myself starving, drooling over some recipe, and rushing either to the kitchen to start cooking or to the supermarket for the ingredients. This was one of those recipes. I apologize if it has the same effect on you, right now, but know you will forgive me once you’ve tried it. Preheat oven to 425 F and adjust an oven rack to the lower-middle position. Grease (or spray with nonstick cooking spray) a 9” x 13” baking dish. 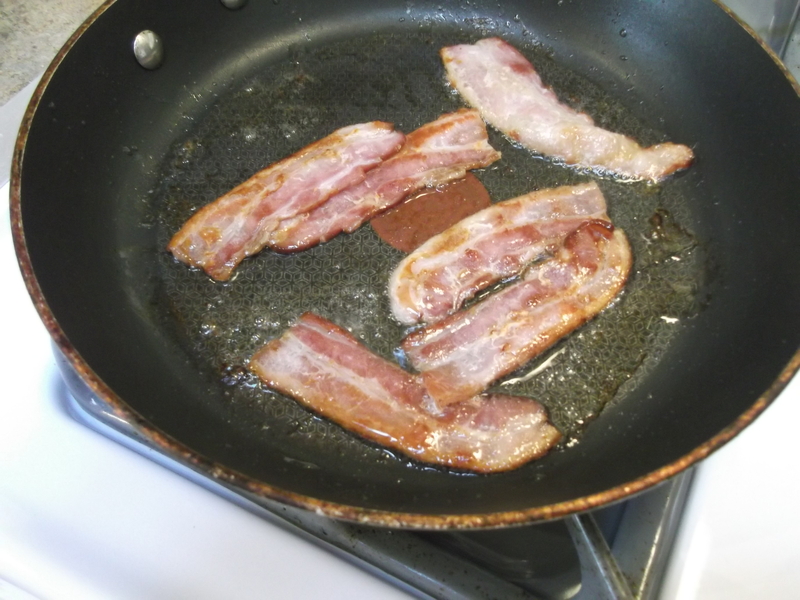 Cook bacon in a medium sized pan over medium-low heat until crisp, about 10 minutes. Transfer the bacon to a plate lined with paper towels and discard all but a tablespoon or so of bacon fat from the pan. 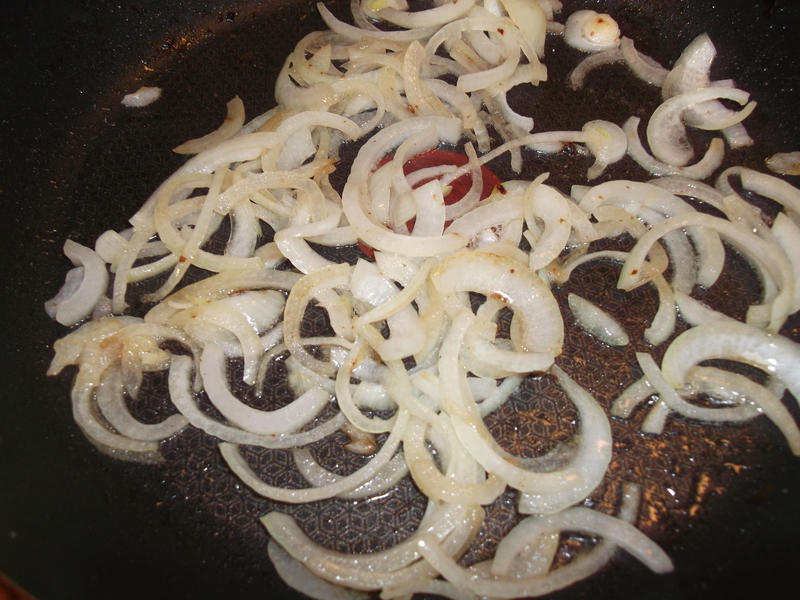 Return the pan to medium-low heat and add the sliced onions and the salt. Cook, stirring often, until the onion is soft and golden, 20-25 minutes. 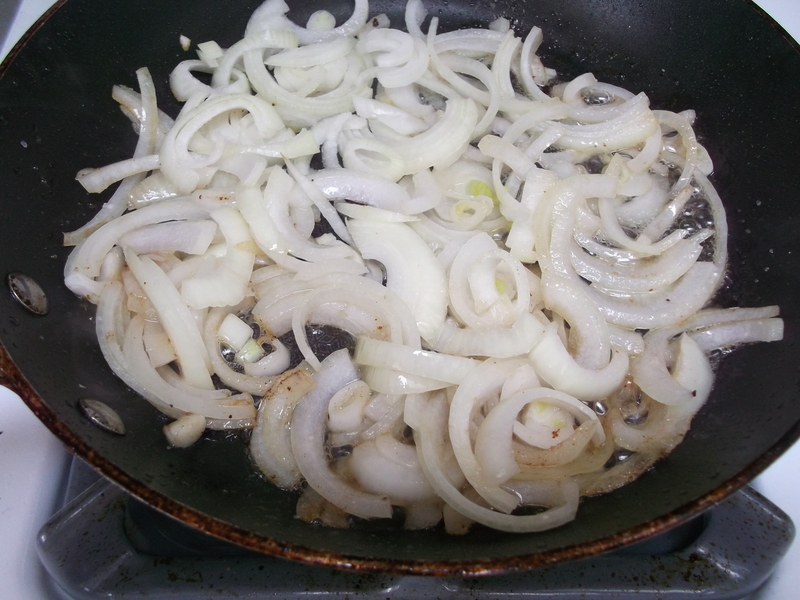 Reduce the heat and add a few teaspoons of water if either the onion or bottom of the pan gets too dark. 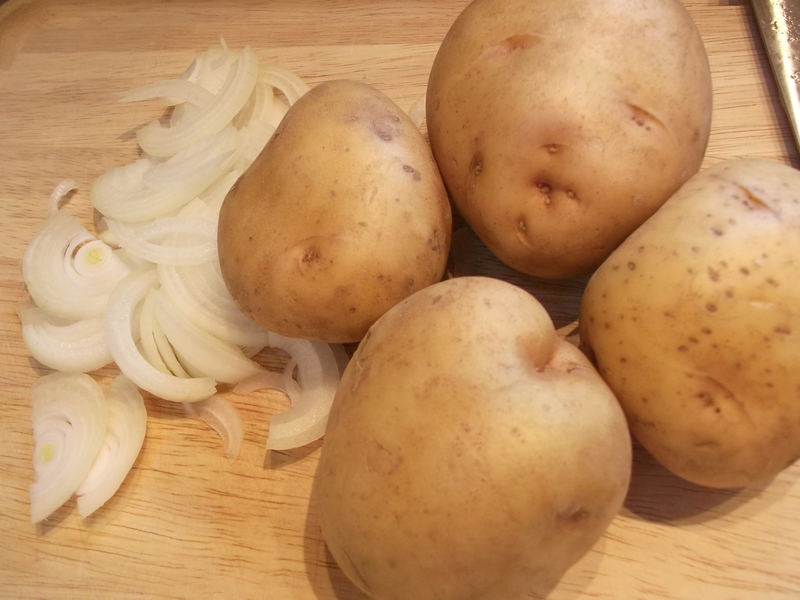 While the onion cooks, peel and slice the potatoes about 1/8” thick (a mandolin makes this step easier). 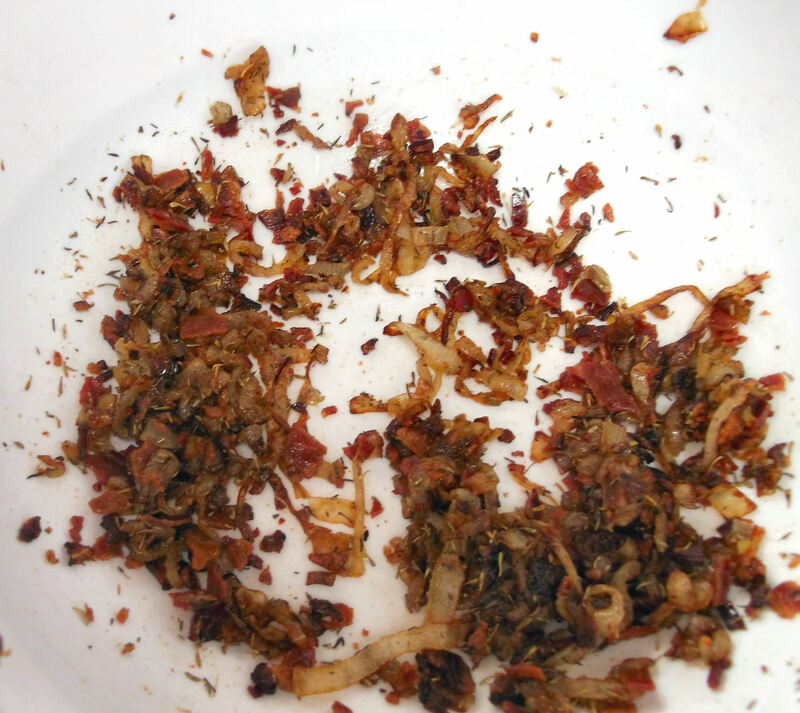 Crush the cooled bacon into small bits and place in a large mixing bowl along with the thyme. Transfer the cooked onions to the bowl, add the pepper, and mix well. Add the potatoes to this mixture and mix until well blended, using both hands, separating any slices of potato that stick together. 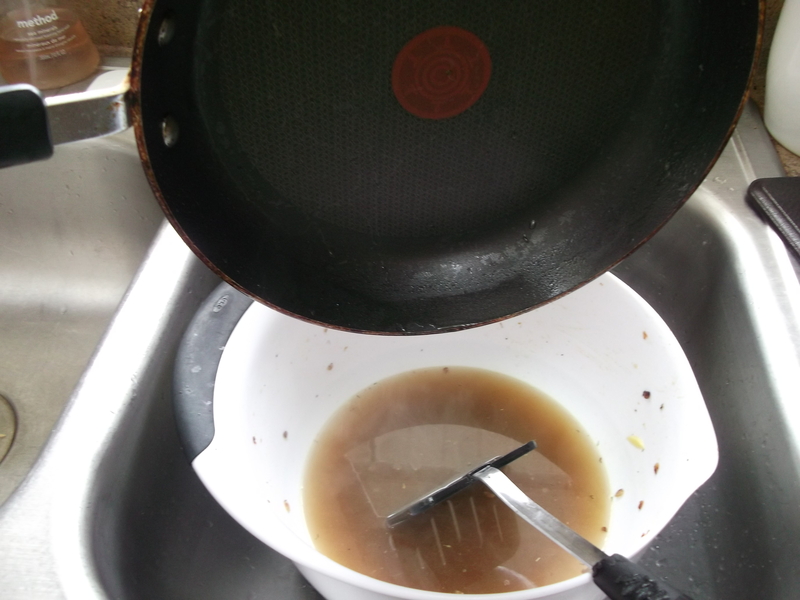 Add the chicken and beef broth to the empty pan and bring to a simmer, scraping any browned bits from the bottom of pan. 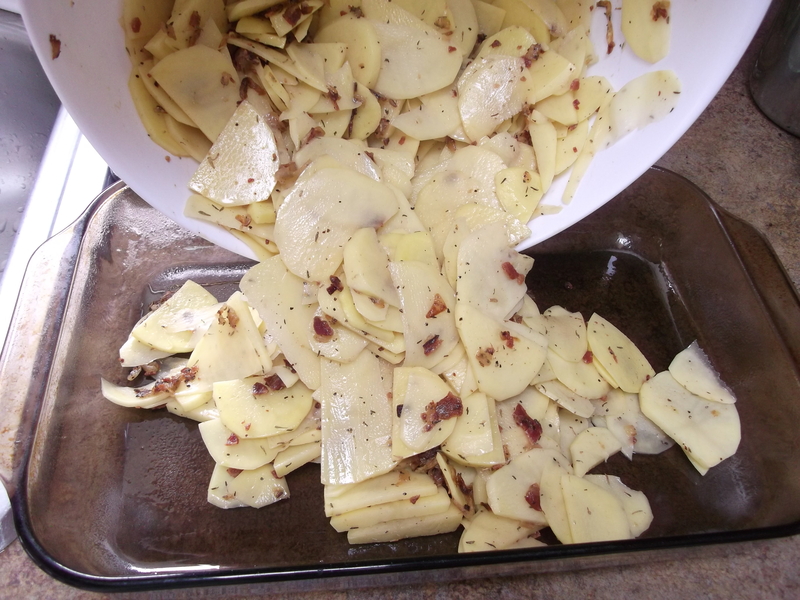 Transfer the potato mixture to the baking dish and press down on them to compress them into an even layer. Carefully pour the hot broth back into the empty mixing bowl, using a spatula to scrape up any remaining bits, then pour this carefully over the potatoes. Drop the chunks of butter evenly over the surface. Bake uncovered until potatoes are soft and brown on the edges, and most of the liquid has been absorbed, about 45 to 55 minutes. Let stand for 20 minutes to allow the rest of the broth to absorb before serving. Note: I made this dish and took photos a couple of different times: once using the full recipe, and once I cut it in half. When I posted it here, I used whichever photo turned out better, so some of the amounts/cookware may look different in some photos. The flavor was the just as rich and delicious both times, though! 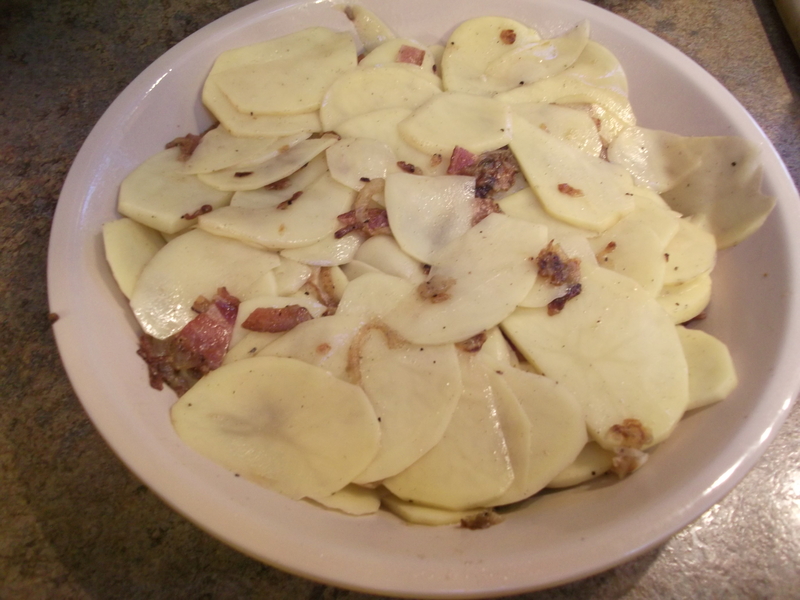 Be sure to use Yukon Gold (or other “gold”) potatoes for best results. They will yield a creamier texture and better flavor. Cook the bacon until crisp. Use a low-medium heat to render out as much fat as you can. Transfer the bacon to a plate lined with paper towels and discard all but a tablespoon or so of bacon fat from the pan. I try to leave enough to coat the onions well. One of my mantras, “fat equals flavor,” holds true in this dish, so while you don’t want it super greasy, don’t be afraid to use all the fat if you need to. 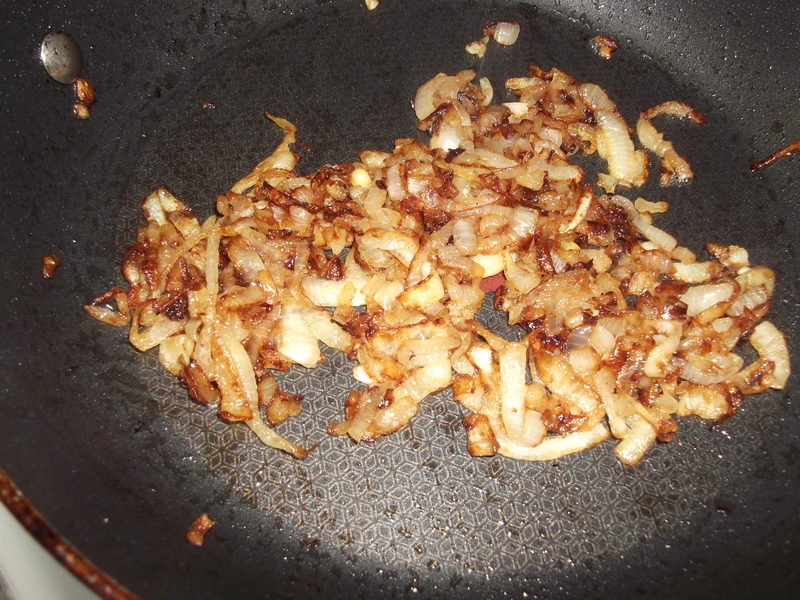 Return the pan to medium-low heat and add the onion and salt. Stir to coat the onions evenly, and cook about 25 minutes, stirring frequently as the onions start to soften, shrink, and brown. While the onion cooks, you can get a lot of other stuff done. Just pause to stir the onions. 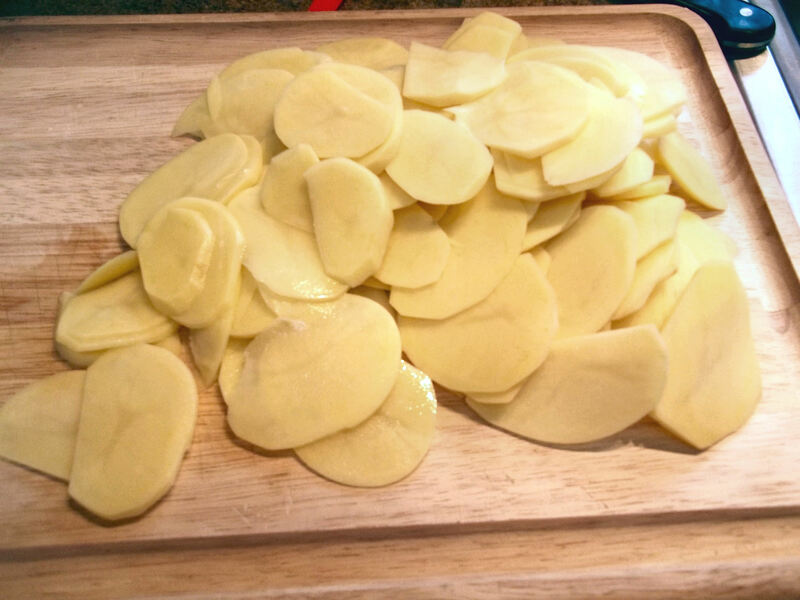 Start by peeling and slicing the potatoes. Aim for about 1/8” thick, but certainly no thicker than ¼”. If you have a mandolin, this step is easier (place the rounded side of the potato against the mandolin blade, so the safety “holder” gets a good grip on the flat part). I’m old school, so I cut them by hand. 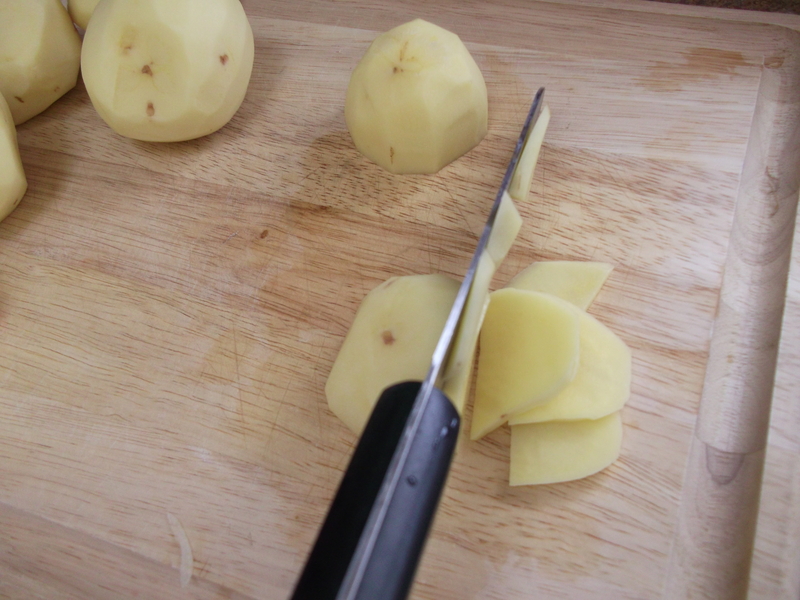 Cut each potato in half and then set it on the flat side so you’re not cutting hands and fingers trying to slice potatoes that would rather roll around the cutting board. Under normal circumstances, there is a neat trick to keep peeled potatoes from discoloring: cover them in water. Do NOT do that in this recipe. The water will wash away the starch on the potatoes, and that starch is very important in thickening the sauce for this dish. While the onion is still cooking, I make my broth. 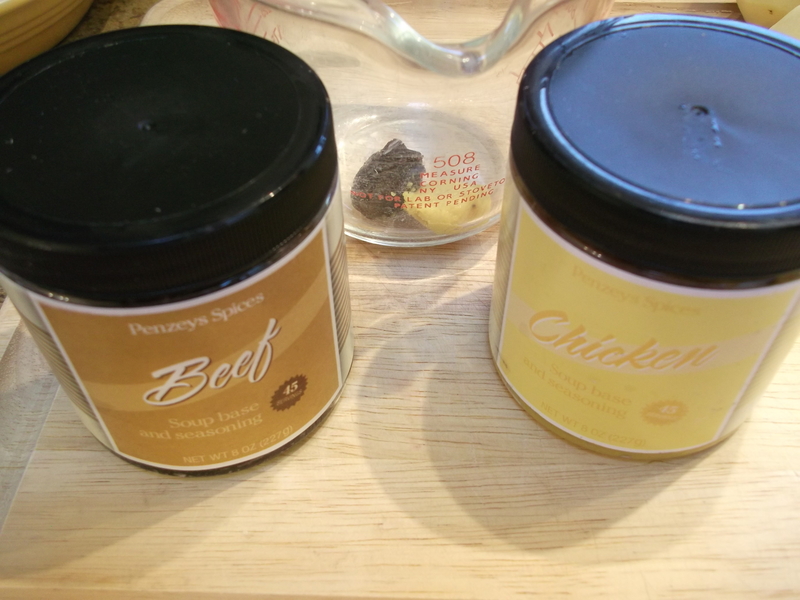 I love these Penzey’s soup bases, and use them exclusively for any stocks or broths I ever need. They taste great, are super easy, and I can make as much as I need each time: just dissolve about a teaspoon of the base per cup of boiling water. Since I try to combine steps and reduce the number of dishes to clean, I make a chicken-beef combo broth for this recipe using a teaspoon of each base in my measuring cup, then adding the full amount (2½ C) of water to that. While the onions are (still) cooking, crush the cooled bacon into small bits and place in a large mixing bowl along with the thyme. 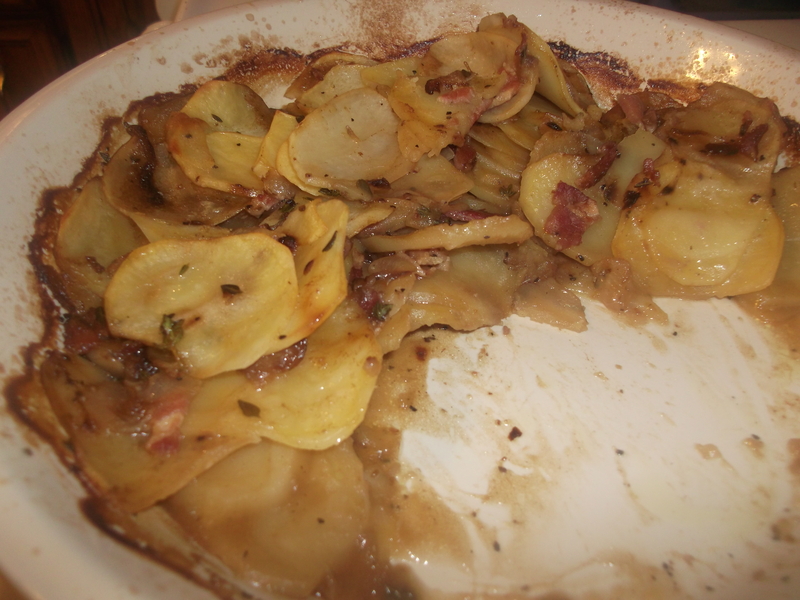 Be careful with the thyme, as too much will quickly overpower this dish. I love thyme, but this is one recipe where I measure it very carefully, especially if using dried thyme. 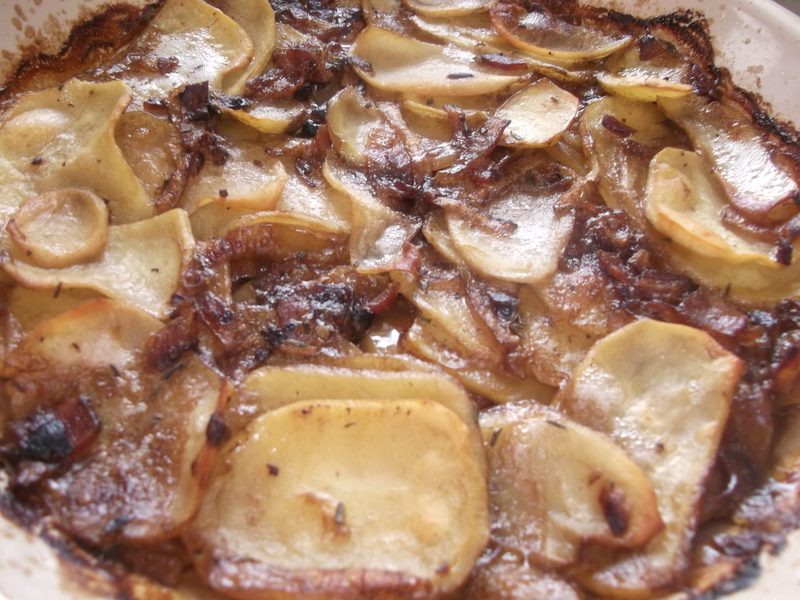 When the onions are done, they will look something like this. Transfer the cooked onions to the bowl, add the pepper, and mix well. Add the potatoes to this mixture and mix until well blended, using both hands, separating any slices of potato that stick together. Transfer the potato mixture to the baking dish. Spread them into an even layer and press down to compact them. Make-ahead tip: at this point, you can cover the potatoes in plastic wrap and refrigerate until you are ready to continue. 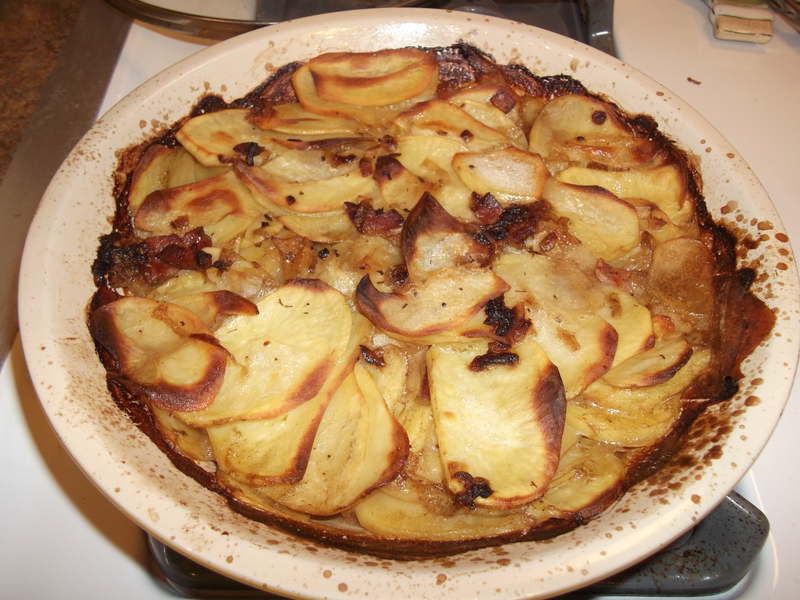 When I halved this recipe, I used a stoneware pie plate: it was the perfect size, the potatoes cooked evenly, and it doubled nicely as a serving dish. Add the broths to the empty pan and bring to a simmer. Scrape any bits off the bottom of pan. Carefully pour the hot broth back into the empty mixing bowl, using a spatula to scrape up all those tasty bits that stuck to the sides. 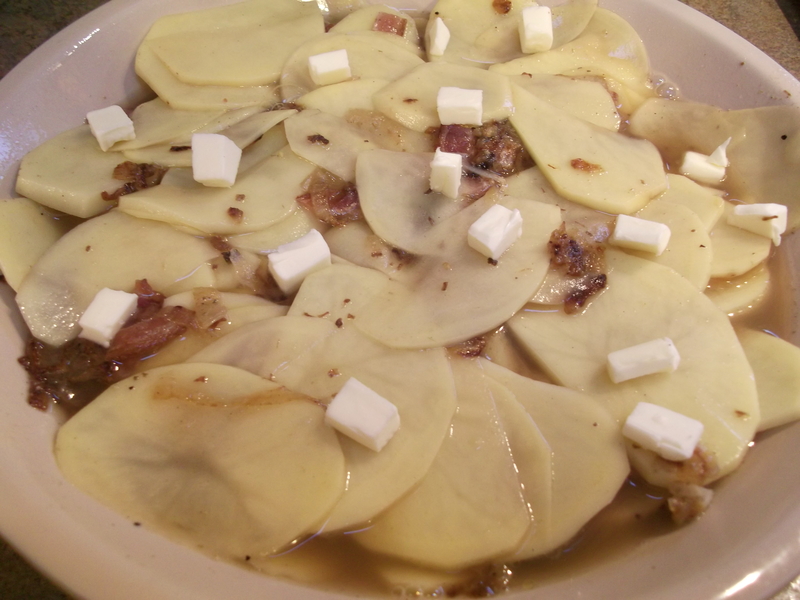 Carefully pour this liquid over the potatoes, and then sprinkle the surface with the chunks of butter. Place the baking dish uncovered in the lower-middle position of the oven and bake until potatoes are soft and brown on edges, and most of the liquid has been absorbed, about 45 to 55 minutes (this baking time is the same even for the half recipe). Let the potatoes stand for 20 minutes before serving. This will allow any remaining broth to completely absorb. 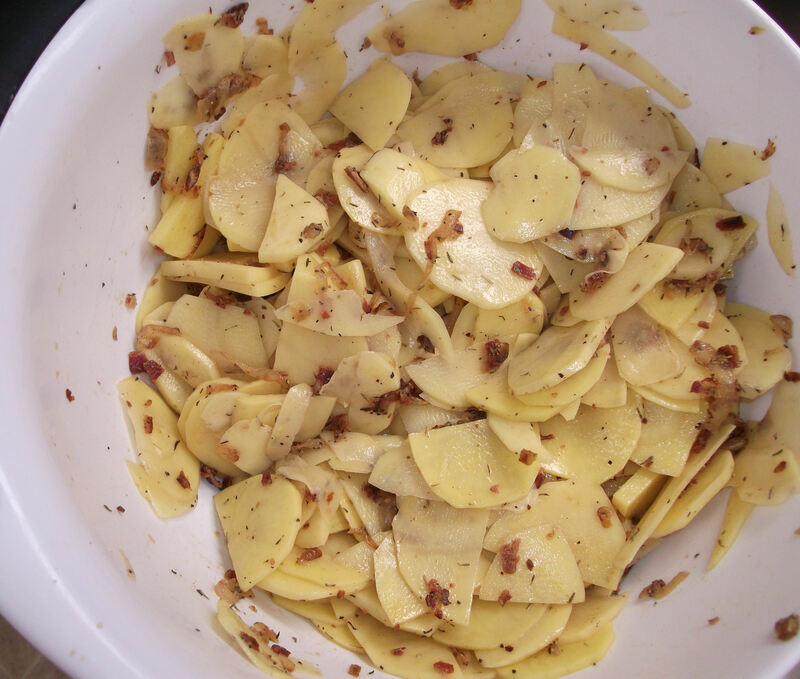 If no one is watching, and you simply cannot wait to try these right away, you can discreetly peel off a couple slices of potatoes from the edges. Sssh…I won’t tell if you don’t. Enjoy! Oh my bacon, they sound delicious! Oh my, this sounds delish. And I love the idea of using the soup bases, especially since I live a fair distance from the grocery store. Gonna stock my pantry with some Penzey’s asap. Thanks for the recipe and your insightful commentary! I made this for our guests at Easter to rave reviews – belated thanks! Thanks for the feedback! Glad to know it was a success!